City leaders, South Jersey power players, and Gov. Christie on Thursday unveiled plans for a billion-dollar project that, if brought to life, would transform the Camden waterfront with glittering high-rises, offices, and restaurants. Liberty Property Trust, the developer that spearheaded some of Philadelphia's most high-profile building projects, including the Comcast Center and the Navy Yard, has signed a deal to create a complex of offices, shops, more than 300 homes, and a 120-plus-room hotel on 16 acres just north of the Adventure Aquarium. Once the agreement is approved by the state Economic Development Authority, which owns the land along with other state entities, the firm could break ground next fall. "Things we could not have imagined have happened," Camden Mayor Dana L. Redd told the audience at the aquarium before introducing Christie. "There's going to come a time when Dana and I can no longer say Camden is coming back," said Christie, who arrived in Camden after watching Pope Francis' speech before Congress in Washington. "We're going to be able to say, 'Camden is here.' "
The Liberty project is the latest - and largest - in a series of developments announced in Camden since passage of the Grow New Jersey act, which provides generous tax incentives through the state Economic Development Authority (EDA) to businesses that relocate to the state's poorest cities. The program, through which more than $1 billion in tax credits have been awarded to Camden projects, has led prominent corporations to announce plans to move there, including Holtec, Lockheed Martin, and Subaru of America. Liberty CEO William Hankowsky cited the Grow New Jersey program as the main reason for coming to Camden, saying companies that move into the new buildings would likely apply for the credits. Property-tax abatements also are available to such projects under the law. Liberty likely would sell the properties to the companies that move in, he said. Several local business leaders have pledged to support the project, possibly by moving their companies into the planned 1.7 million square feet of office space. They include George E. Norcross 3d, the South Jersey power broker, head of Cooper University Hospital, and longtime friend of Hankowsky's, who said he pitched the waterfront idea to the developer. Norcross said he would invest $50 million of his own money, and his Marlton insurance firm, Conner Strong & Buckelew, could move to Camden. "There's momentum in the city," said Hankowsky, who said Liberty would invest between $700 million and $800 million. Hankowsky said Liberty would develop a plan with the city to hire locally and focus on job training for city residents. 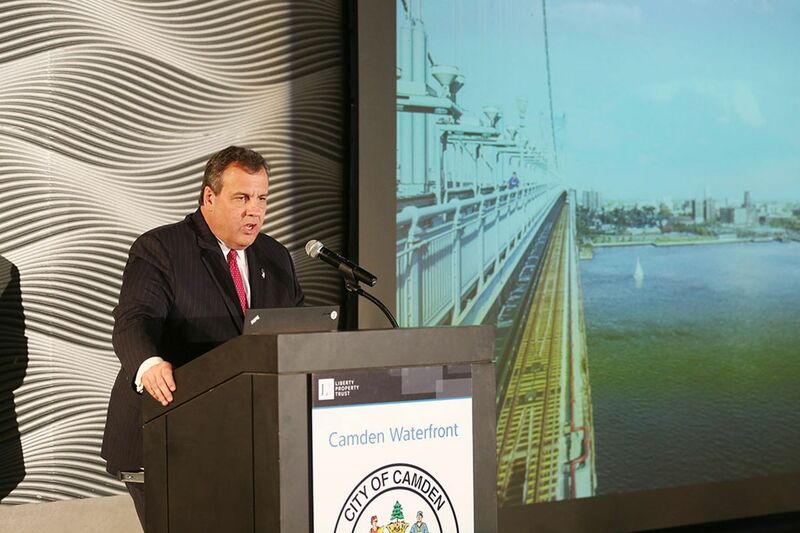 The project will bring thousands of construction jobs and 4,000 permanent jobs to Camden, he said. Longtime residents have learned to greet such announcements with skepticism, as waterfront development has eluded the city for decades. The aquarium in which Thursday's announcement took place was supposed to be the catalyst for the waterfront's revitalization when it opened in 1992, but it led to no significant development and few jobs for local residents, and eventually became a symbol of unfulfilled promises. In 2002, when the Municipal Rehabilitation and Economic Recovery Act put Camden under state control for eight years, money earmarked for city projects paid for a $25 million expansion of the aquarium, which pays no taxes to Camden. Later projects, such as the Susquehanna Bank Center and Campbell's Field, also failed to spark waterfront development. The land north of the Benjamin Franklin Bridge, prime real estate on the river where the Riverside prison once stood, has sat empty since 2009. Asked why he believed his project would succeed, Hankowsky said it would create a complete neighborhood serving residents, tourists, visitors, business staff, and others. "Given how difficult things have been in Camden, they have a long way to come back from," he said. "You can't do this in pieces. You need to do this in a big, comprehensive way." Next month, the EDA is to review and act on a request to allow transfer of development rights in the land from Steiner Development, which owns the aquarium and once planned to build next door. Liberty will take it over, then begin due diligence, which Hankowsky said could take six months. Companies expected to join the project include the Archer & Greiner law firm, which has offices in Haddonfield and Philadelphia; the Cherry Hill supply-chain company NFI Industries; and the Michaels Organization, a Cherry Hill housing company that has done work in Camden. The companies have long-standing personal and professional ties to Norcross, whose brother, U.S. Rep. Donald Norcross, championed the Grow New Jersey law as a state senator. "In order to get true believers, I had to demonstrate my commitment," George Norcross said in an interview. "And then I went to friends of mine. I went to them with a pitch, and said we should all consider investing."